Our design for Quartz (qz.com) accommodates the needs of their rapidly growing office while preserving the quirky, intellectually playful aspects of the company's ethos that they commonly refer to as their 'Quartziness'. 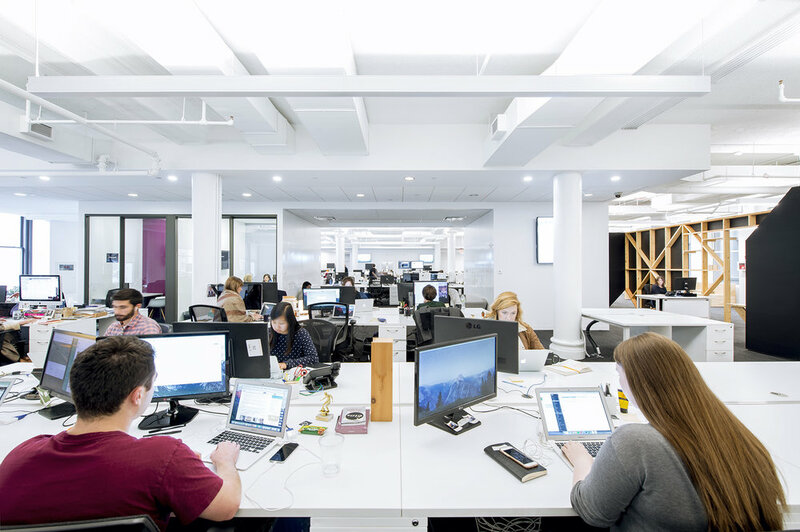 The open floor plan layout is flexible with flowing circulation that encourages people to take different routes around the office (which promotes chance encounters with colleagues from different fields of expertise.) 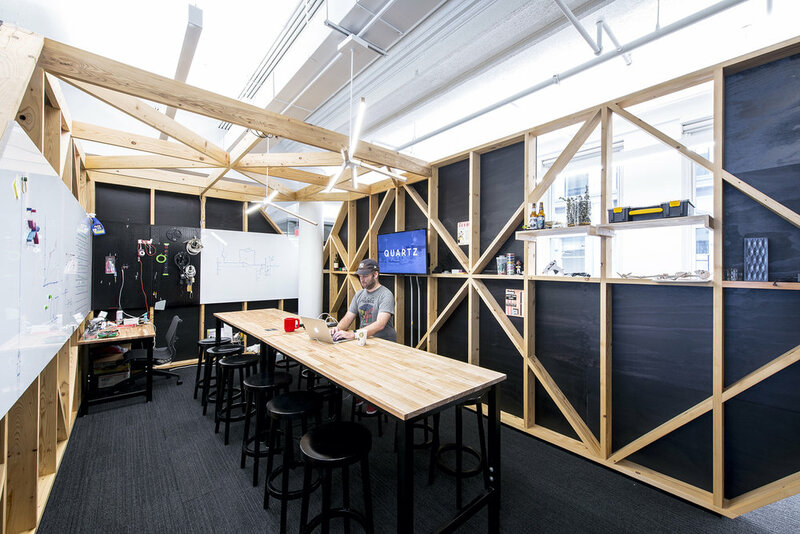 A broad expanse of "seating cubbies" lines the window wall; the cubbies provide open book storage for editors, and they have become a gathering destination for small group chats. A range of conference rooms provide ample meeting spaces for larger groups, and 'phone booth' rooms serve as quiet retreats for private calls, interviews, and even meditation. We anchored the main spine of the office with a series of Quartzy Spaces. This filtering buffer between the main entry and the work area is an undulating, wood-frame structure containing a coffee bar, reception area, book lounge, and a maker space. These break-out/brainstorming spaces are quirky, creative meeting destinations that support the company's culture and collaborative process. As these Quartzy Spaces evolve through daily use (for activities like Friday evening cocktails, horticulture, book collecting, robotics, and artisan coffee brewing) they will be shaped by the identities and aspirations of the people who work at Quartz. We transformed the most remote area in the office into a large town hall 'Arena' with bleacher seating on three sides, an open pantry kitchen, and furniture that can be reconfigured for staff lunches, TED-talk type presentations, and town hall meetings. Undulating shelving wraps the room, a play on the oversized decorative moldings found on the facade of this historic cast-iron building. The space has a fully equipped, robust AV system and a deployable stage that allow Quartz to host launch parties, movie screenings, and tech symposiums on a monthly basis.